Hello and welcome to day nine of our nightstand series! You can see the entire series here. Today's project is our third "floating" installment (we already made floating boxes and a floating bookshelf). With both a shelf and a drawer, this plan offers plenty of storage options in a style that is simple, sleek, and unique! Start by attaching the sides (B) to the back (A). Keep the edges flush. 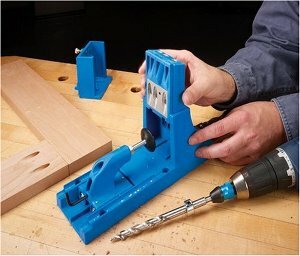 Use a Kreg Jig (this will hide the holes on the back), or drill through the sides into the back. Attach the top & bottom (C). Use a Kreg Jig or drill through the top and bottom into the sides and back. Next build the drawer box. 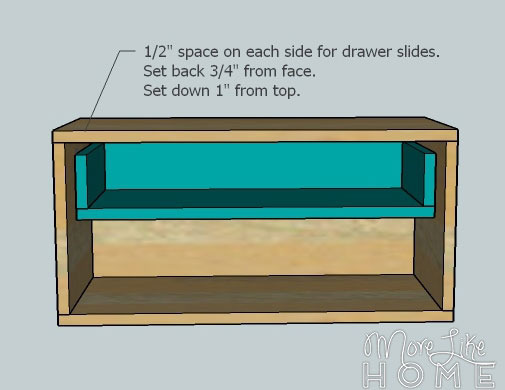 Start by attaching a drawer side (E) along each side of the drawer bottom (D). Keep the outside edges flush, and attach with a Kreg Jig or by drilling through the bottom into the sides. Then slip the drawer back (F) between the sides and attach it in the same way, keeping the outside edge flush. Double check the opening of the nightstand - the drawer box should end up 1" narrower unless your drawer slides require a different allowance. Follow the instructions on your drawer slides to install the drawer box. 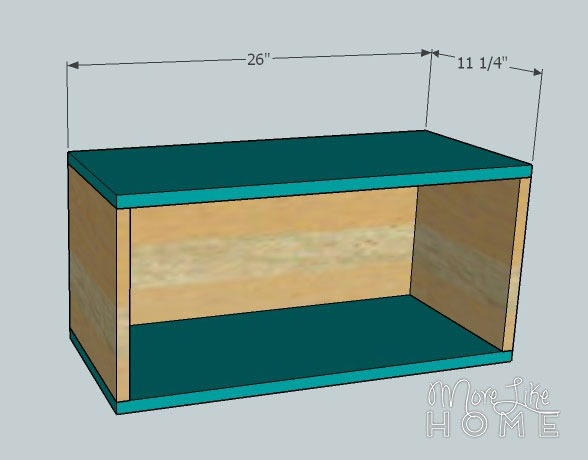 The drawer box should be set back 3/4" from the face of the nightstand (so you drawer front ends up flush later) and 1" down from the top. 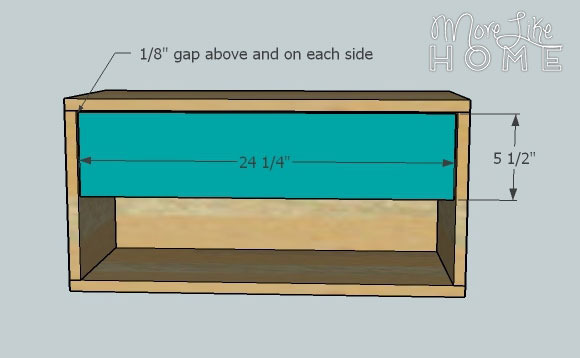 Set the drawer front over the drawer box and center it with 1/8" gap above and on each side. 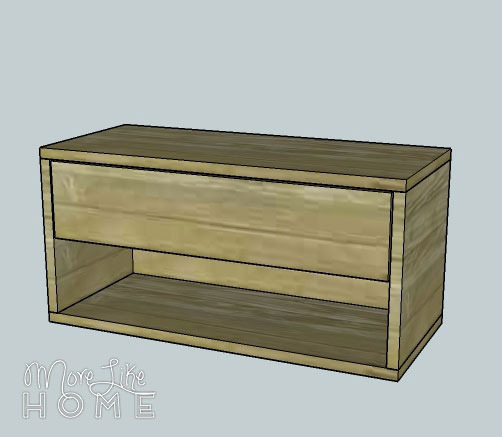 Use glue and finishing nails to attach the drawer front to the drawer box (you can also reinforce it with a Kreg Jig). The building is done, now you just have to finish it! Start by filling any holes with wood filler. Let it dry, then sand it smooth (repeat if necessary). Then sand the whole table smooth for a great finished product (a good sanding can be the difference between looking professional vs. crafty). Then finish with any paint or stain and polyurethane you like. You can add a drawer pull if you like, or to keep the simple look just use the lip under the drawer front as a pull. 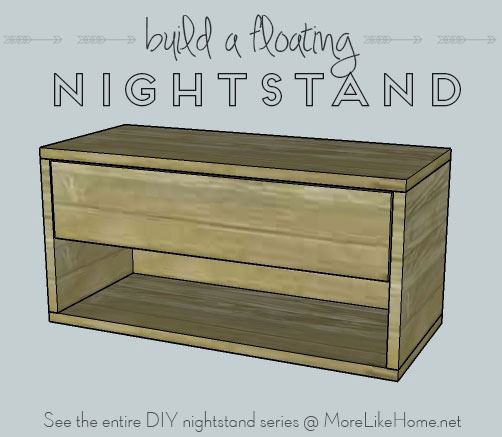 We're halfway done, there are still nine more days of DIY nightstands coming up! 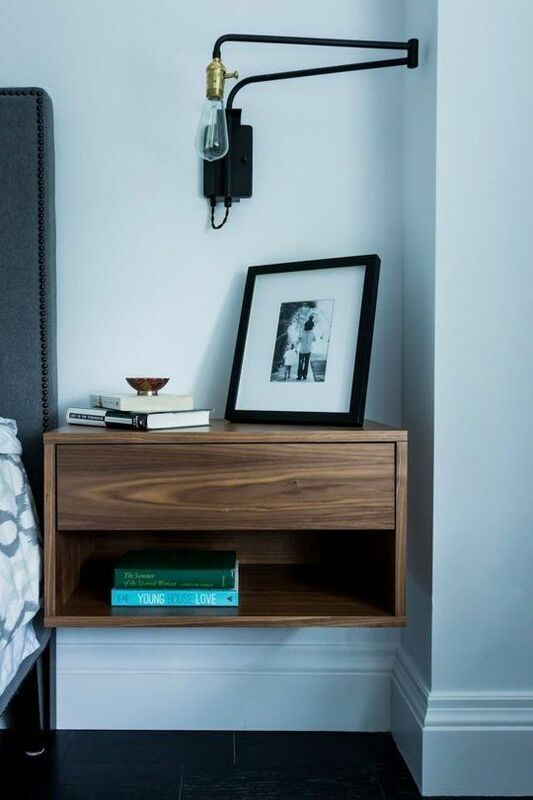 This is a great looking nightstand! How do you attach it to the wall though? Screw it directly to the wall - take the drawer out and drill through the back of the nightstand into the wall, being sure to hit studs. I'd say you need at least 3" screws, depending on the thickness of your drywall. Cut measurements are wrong. Cut sides to 11 1/4". Cut drawer front to 24 1/4". I used a kreg jig and had no need for 2 1/2" pocket screws. So sorry about that! Thank you for commenting, everything should be fixed now. I'd like to make this without the bottom shelf area. 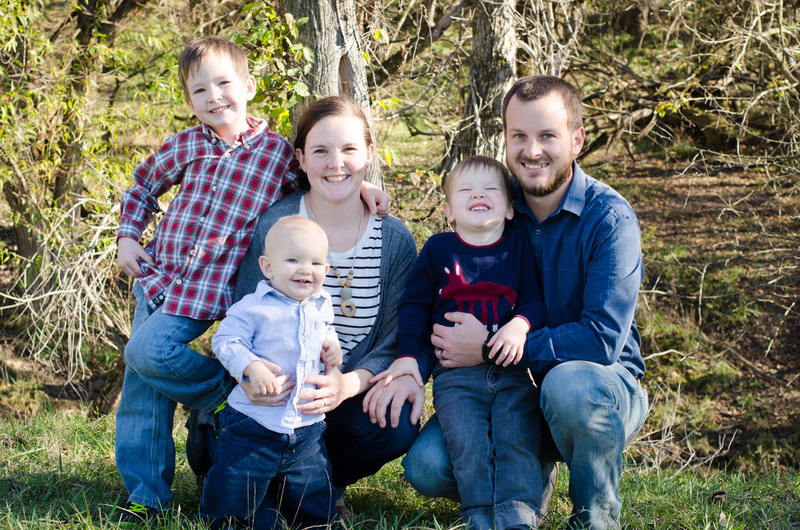 What measurement changes do I need to make? I'm rather inexperienced, I'd hate to mess it up figuring this on my own. 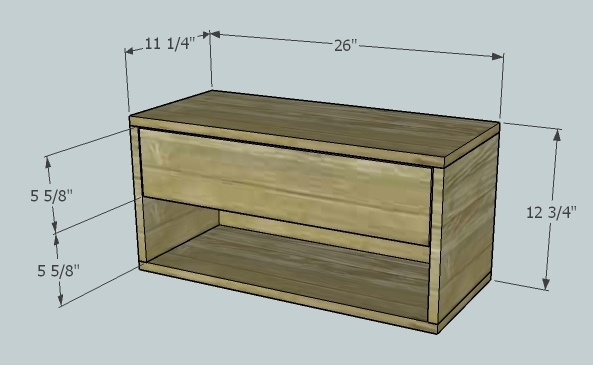 Hi, You would need to make the sides 5.75" tall to fit just the drawer. You'll also need cut the back down to that height as well. Happy building! Hey love the finish on these. What type of wood/stain did you use on these? Hi! Unfortunately the picture is an inspiration photo I found on pinterest, so I'm not sure about the finish. The other images are just drawings from Sketchup. Sorry I can't help! I made two of these for my guest bedroom. Thanks a bunch for the idea. I used led lighting underneath to give it a floating effect. Just wondering what kind of weight these can support? Looking to do a concrete top surface. 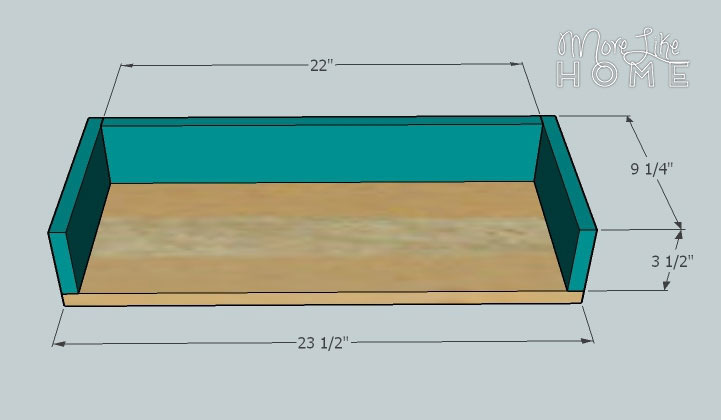 Hello - did you happen to use these plans for your concrete countertop? We are looking to do the same... wondering how you did it. Thanks. Looks like a great tutorial and relatively easy to build. My only problem is I want to make it a little shorter and need dimensions in cm... Can you help? 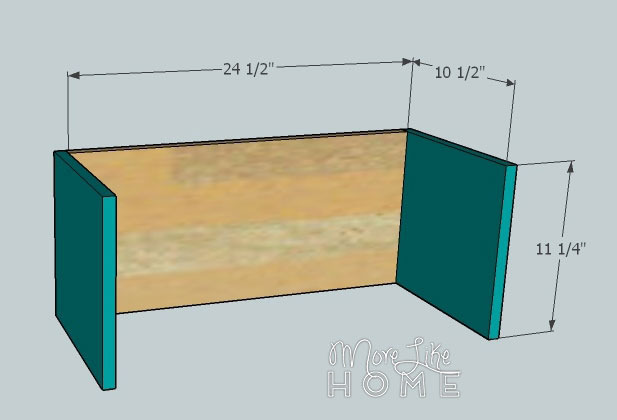 I want the top/bottom to measure 55 cm across (roughly 21.8 in)...what should all the other cuts be， specifically the drawer? Glad you figured it out. :) Have fun! Where did you find 9-inch side mount drawer slides? I have looked at the big box stores and on-line and can not find anything shorter than 10-inch. The catch is that they sometimes don't include instructions or screws. :/ I haven't tried these specific slides, as I haven't built this myself. Hope that helps, though. The measurements are off.. if the sides are 11 1/4x 12.. and the back is 24 1/2 by 12 and you screw the sides into the back keeping the 12in flush... you have 11 1/4 depth which has the top and bottom too long at 12.. so wouldn’t they need to be 11 1/4 x 26? What is a good resource for finding wood slabs? We'd like to do solid walnut.